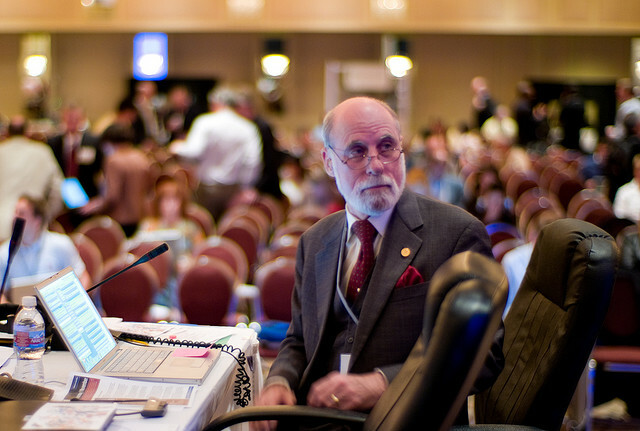 Vint Cerf, one of the recognized founders of the Internet, is joining the federal government … again. President Obama on Thursday announced his intention to nominate Cerf, now a vice president and chief Internet evangelist at Google, as member of the National Science Board of the National Science Foundation. While working at the Defense Advanced Research Projects Agency, Cerf, along with Bob Kahn, are credited with developing the technology that allowed computer to transmit information between themselves which became the foundation of the Internet. Cerf also worked as MCI where he was part of the development of the first commercial email system, MCI Mail, that was connected to the Internet. The National Science Board establishes NSF policies within the framework of applicable national policies set forth by the president and Congress and serves as an independent policy advisory body to each on science and engineering research and education issues.